On March 11, 1881 the transformation of the neighborhood south of Houston Street from residential to commercial had been underway for years. Where brick-faced Federal style homes had stood, towering loft structures clad in cast iron were being erected at a dizzying pace. On that day Freeman P. Woodbury and his partners purchased No. 109 Prince Street, a “three-story frame (brick front) store and dwelling,” as described by The Real Estate Record & Builders’ Guide; the two story brick house and store next door at No. 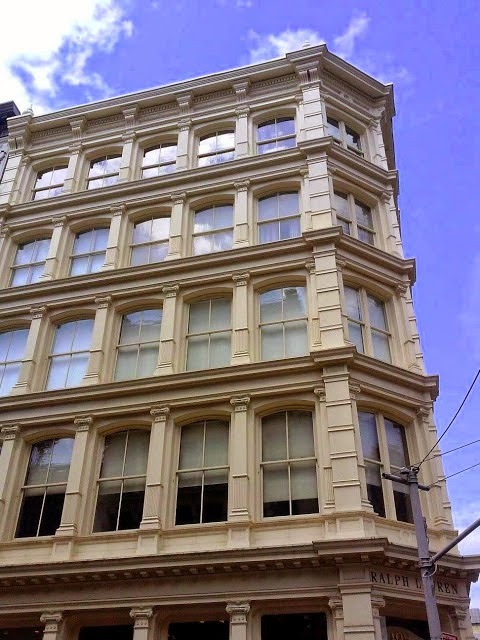 119 Greene Street; and the abutting No. 119-1/2 Greene Street, a three-story brick dwelling. The men paid $36,000 for the combined properties—nearly $800,000 today. Woodbury and the other investors, C. H. Woodbury among them, commissioned Jarvis Morgan Slade to design a store and loft building. As was the case with the majority of buildings in the area, Slade decided on cast iron for the new structure. No. 109 Prince Street, however, would be somewhat different. There was no need for elaborate ornamentation to lure upscale shoppers, as was the case with the nearby Broadway buildings. Instead, Slade designed a five-story French Renaissance structure of quiet dignity and nearly severe lines. The cast iron allowed the architect to incorporate large windows that flooded sunlight into the factory spaces of the upper floors. Each was separated by flat pilasters fluted from the waist down. Banded piers separated each grouping of three openings on the Greene Street side. Visual interest (and added interior light) was achieved by a chamfered corner. 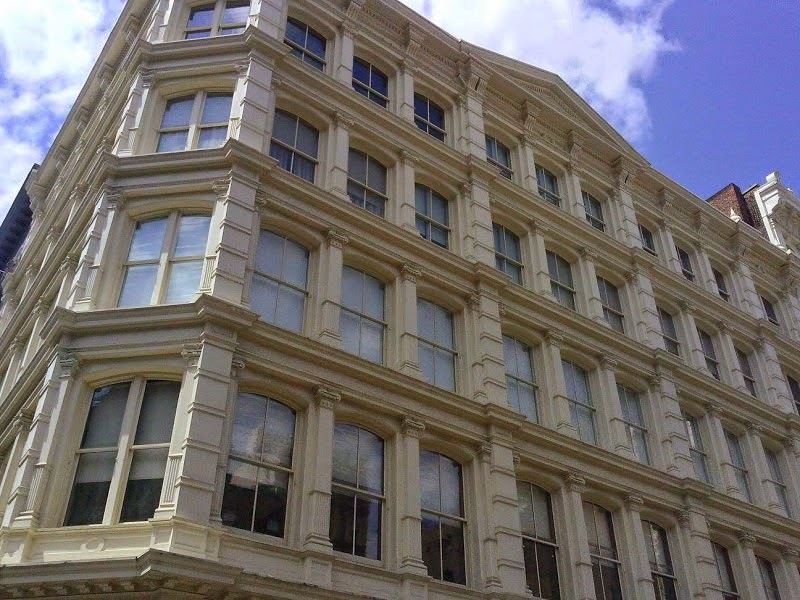 A shallow pediment graced central Greene Street section. The handsome structure was completed in 1882 and before long apparel firms and fabric dealers filled its spaces. In 1891 Charles Miller, shirt maker, was here and by the turn of the century No. 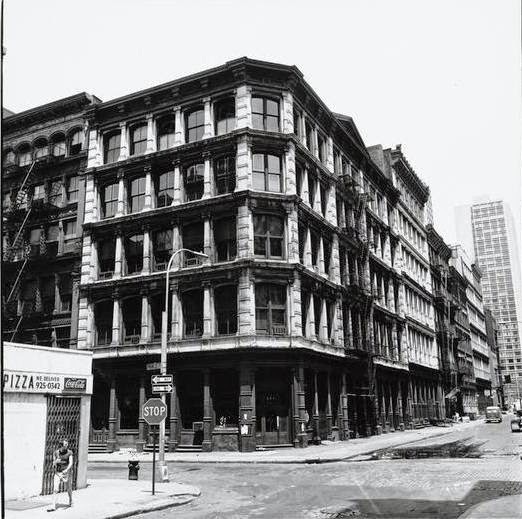 109 Prince Street was squarely in the midst of the silk district. By 1908 silk dealer Singuro Arakawa ran his operation from the building. The Japanese businessman lived at the Nippon Club at No. 44 West 85th Street. The club held its own among men’s clubs in the city, offering lodging for single men, dining rooms and social areas like the billiard room. By 1913 L. & I. Gleichenhaus would share space in the building, manufacturing cloaks. But the Silk and Garment Districts were slowly inching northward and as mid-century approached, No. 109 Prince Street saw a different type of tenant. In 1942 the Main-Chem Corporation, manufacturers of chemical supplies, was here. It was the foreboding of drastic changes in the neighborhood that would be dubbed Soho. As the years passed many of the great loft spaces sat empty as the cast iron facades rusted and windows wore a gritty layer of dirt. Although No. 109 did not suffer the humiliation of street level modernization; its façade was grime-streaked by the 1970s and Slade’s striking design was essentially lost in what had become an overlooked warehouse district. Then, as is often the case with Manhattan neighborhoods, a renaissance occurred. Lured by low rents and large, sunwashed spaces, artists moved in. Factory lofts were converted to residential art studios and stores were transformed to trendy art galleries. 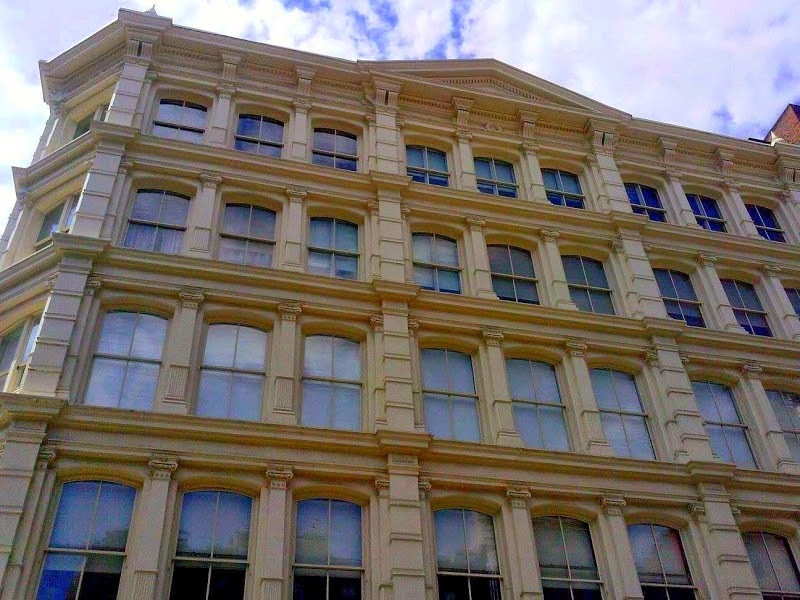 One by one Soho’s cast iron gems were revived. In 1992 the architectural firm of Kapell & Kostow was set to work on renovating the 32,000 square foot building to residential and retail space. Included was a complete restoration of the cast iron façade. Where details were missing or irreparably damaged, new castings were fabricated. Each wood-framed window was custom-crafted. The sale of one of the new apartments in 1999 reflected the massive change in the neighborhood. Where only two decades earlier trucks still banged along the stone-paved streets, a one-bedroom, one-bath condo was put on the market for $1.375 million. It boasted a private elevator, 4,000-square feet of living space and 13-foot ceilings. 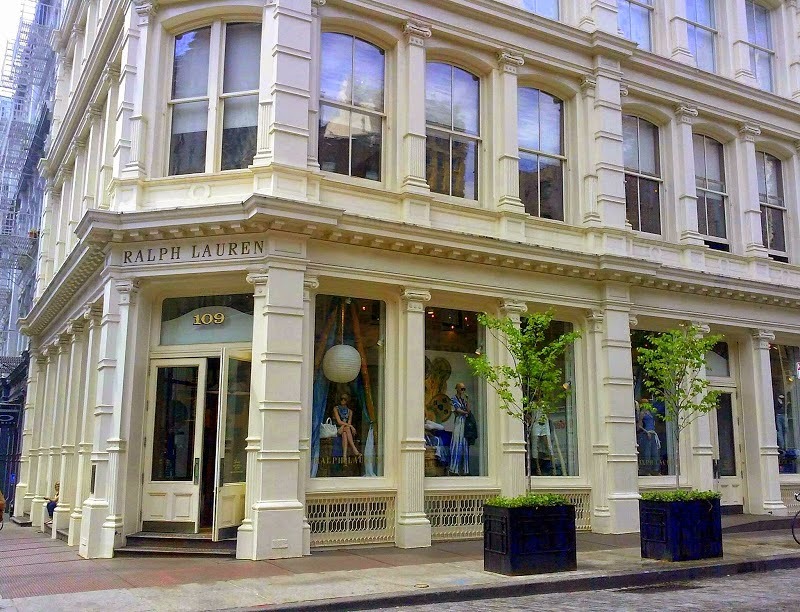 Today a Ralph Lauren store engulfs the entire ground floor of the glistening-white structure. And Jarvis Morgan Slade’s distinguished French Renaissance building is once again receiving the attention it deserves. Love the Downtown stuff. Thanks. I LOVE that the ground level has not 'modernized' or otherwise damaged. An exquisite cast iron building survivor...........thankfully. I agree completely with the previous poster about the ground level remaining intact. Love your very accurate blog, but one thing stands out: the spelling of the neighborhood. It is SOuth of HOuston. Houston is a proper noun. So, it is capitalized. That is, SoHo. Soho is a neighborhood in London. I see you got "NoHo" correct.